KPPA is a cohesive team comprising of enthusiastic individuals with varied backgrounds, skills and experiences. KPPA's long innings would not have been possible if it was not for our associates and sub consultants who have been working with us for a long time some of them as much as four and a half decades. His design philosophy is that every project should have unique innovative features, be optimally functional, cost effective with unmatched aesthetics. A passion for perfection he graduated with honours from BMS college of Architecture, and with a post graduate specialization in Urban Design from USA. He interned with M/s Stein, Doshi & Bhalla, New Delhi and worked with Womack Hampton and Trendmaker Homes in Dallas, USA. We currently have enthusiastic & innovative architects with several years of experience working with us who have got their professional degrees from reputed colleges. They have all undergone a 5 year B. Arch. Program. We also have a landscape consultant. We have efficient drafts people project co-ordinators who have been trained as Architectural Assistants and help in the production drawings. This department is headed by Mr.Mahaveer who has been with the firm since 20 years. He has a Bachelor's degree in Civil Engineering from one of the state's leading Technical institutions. He is assisted by civil engineers and structural engineers. We also have tie ups with freelance architects who work with us on projects. Tie up with Structural and Services Consultancy firms are in place as this will enable the clients to have a one stop solution. M/s Chetan Infra Tech Consultants Pvt. Ltd. Soil Consultants – Nagadi Consultant Pvt. Ltd.
Information Systems – Pro Active Technologies. 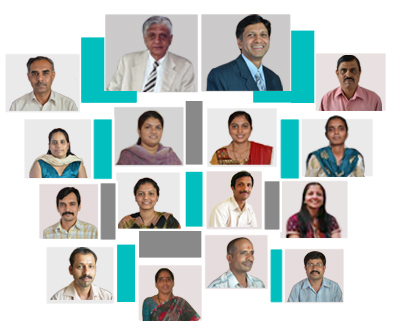 This department is headed by Mr.Anand who has been with us since 30 years. He handles all the company's administration, supported by others to ensure good smooth functioning.